Crowdfunding PHP Script are essentially needed by people who want to manage charities, donations, donor details, fundraising campaigns, etc. Therefore, today in this blog we have discussed some of the best PHP scripts that offer top class features like multiple payment gateways, responsive dashboard, secure login along with multi-lingual support. In addition, all the listed scripts are compatible with the latest browsers, offer advanced customizations, easy to install, and most of these scripts allow unlimited campaign and reword creation for fundraising. Our motive is to bring light to such PHP scripts that offer above listed features and services at an affordable cost. So, let’s get started with the scripts without wasting any time. GetFund is one of the best fundraising script for PHP available in the market. With this, you can collect funds, donations, & different type of charities and manage their details with ease. It offers a crowdfunding platform that is translation ready, provides ajax loading and much more. Other than that you also get frequent free updates, technical support, contact form, pre-designed pages, etc along with the script. The basics services of this fundraising script are offered by the regular plan which will cost you $49. The extended plan for this script is offered at a cost of $295. It includes multiple payment modes, social login, and fund campaign facility. 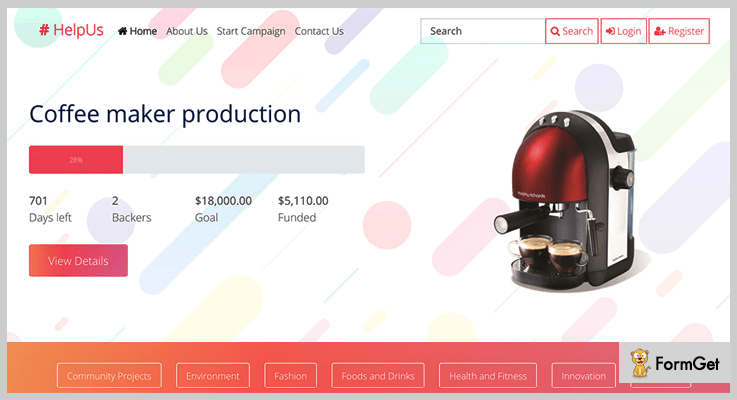 With this PHP script, you can easily create fundraising campaigns and design different type of rewards for contributors. This script allows you to accept donations via PayPal, Stripe and direct bank transfer can also be done. Social sharing functionality is also available for instant sharing of fundraising posts and advertisements. Plus this script also provides FontAwesome icons, payment tracking, reCaptcha for spam prevention and more. Fundme has a strong admin panel using which you can add multiple volunteers. Each volunteer has rights to create unlimited campaigns for different types of fundraising. It has secure bcrypt password hashing which is helpful in safe user login, members in this script are allowed to change their name, email address and password. The regular license of this PHP script with entry-level features and services comes with a price tag of $41. $205 is the price which is charged for the extended license of Fundme PHP script. Provides an advanced dashboard through which you can manage donations, amount of fund raised, members, campaigns and other details. With this funding, script members are allowed to create an unlimited number of campaigns to collect different type of funds, donations, etc. 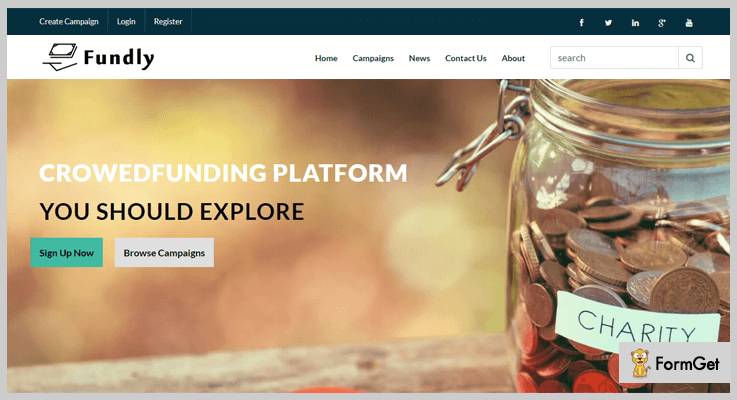 The campaign section helps you monitor details like goal amount, the total fund raised, campaigns status, date and allows you to edit details as well. It also comes pre-equipped with ajax pagination facility, social sharing, SMTP support, and multiple currency support. If you want to start your own fundraising website then Crowdfunding Starter script will be the best option for you. As it allows users to buy digital coins for donations, helps you invite fundraisers, donors, and backers through campaigns. 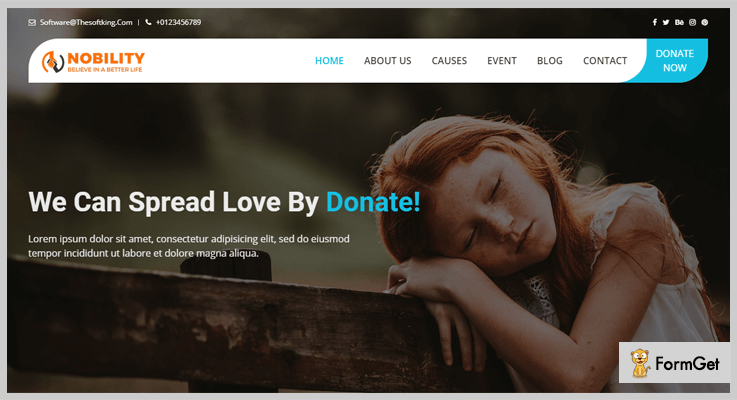 In addition, this PHP script is fully responsive, customizable, and helps you manage donation details from an easy to use dashboard. For the regular plan, you will be charged an amount of $21 which will include quality check, free updates, and various fund managing features. For the full access of the extended plan of this script, you will have to pay $105. It provides a flexible funding model with which you can create unlimited projects, add rewards, manage user and other crowdfunding details. You can use this as a standalone funding script to collect funds and manage donations. It requires no 3rd party installation. This is an SEO optimized PHP script that comes loaded with advanced on-page SEO and various marketing modules. Supports various browsers like IE9, IE10, IE11, Firefox, Safari, Opera, Chrome, Edge, etc for cross-browser compatibility. Nobility is a top class PHP Crowdfunding script that helps you collect and manage funds, charity, etc from different mediums. It has cross-browser support, responsive design, social sharing and other facilities. That is not all fraud protection along with 100% security, custom donations and newsletter subscriptions are also provided. The first plan has got a price tag of just $50. It includes 6-month support, multiple customizations, and various fund management features. The second plan will cost you $205 with which you get cross-browser support, enhanced features, responsive design, crowdfunding features, etc. Extremely user-friendly dashboard to view details like total subscribers, new donations, all donations, volunteer details, etc. For collecting donations this PHP script supports PayPal, Skrill, Stripe, Bitcoin, bank donations, etc. It also holds a dedicated volunteer section through which you can manage different details related to each and every volunteer. The admin section allows you to manage subscribers, setup logo & icons, manage menu, sponsor and other settings. 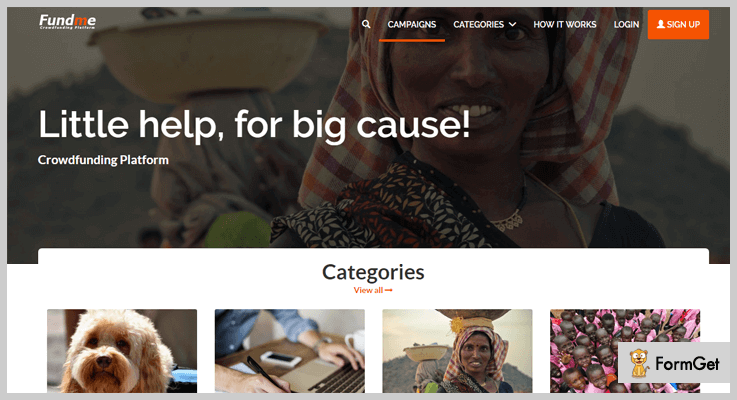 Fundly is a user-friendly PHP script that can help you have an online fundraising platform. With this script you can create personal fundraising pages as well as non-profit fundraising can also be done. There is no limit on campaign creation, helps you collect donor details, and multiple payment gateways are supported like PayPal and Stripe. Regular license is priced $46 for quality checked, updates, 6 months support, and basic funding facilities. For the extended license, an amount of $225 will be charged. It will give you full access over various enhanced fund management features. Helps you perform different operations on campaigns like updates, decline or inactivate campaigns, auto stops campaigns that have expired, manage payouts and more. With this PHP Crowdfunding Script, you can simply share campaign details on various social media platforms like Facebook, LinkedIn, Google+ etc. It offers an advanced dashboard that allows you to manage user details, campaigns, payout history, email templates, pages, etc. The script supports two type of payment gateways PayPal and Stripe. You can manage payment gateway settings without much hassle through this PHP funding script. This is another crowdfunding script which is simple to install, comes loaded with reward-based and donation-based funding system. Allows you to add unlimited rewards to different campaigns and manage the donation details with ease. Also provides a recently funded section that shows each detail related to all successful campaigns. To enjoy the enhanced and extended services of HelpUs PHP script you will be charged $399. This is a GDPR compliant PHP script that supports cookies notice feature, users delete request, etc. Offers an advanced media manager functionality with which you can insert images. It also permits social media login from Facebook, Google, Twitter, etc. Admin panel helps you manage general settings, payment options, theme settings, reCaptcha and multiple other options. This is an SEO friendly script which is cross-browser compatible, clean coded, offers comments module and social sharing. 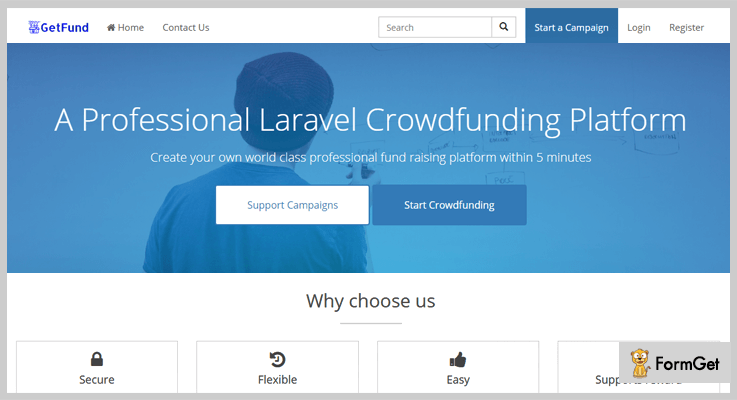 Finally, we have arrived at the closure of this blog on best Crowdfunding PHP Scripts. I hope that after going through this blog once, you will find the correct script which can help you manage and raise funds for a good cause. If you have got any type of queries, do let us know them in your comments below. We will try to get back to you as soon as possible.